Malaria funding and commodities are in better shape than ever as we enter the final year of the MDGs, but gaps remain that must be filled. The world has made once-unimaginable strides in the fight to defeat malaria over the last decade. The final year of the Millennium Development Goals (MDGs) period will be a pivotal one for capitalizing on previous progress and accelerating our gains. Our hope is that we achieve near-zero child deaths from malaria in this banner year. There is much encouraging news on the malaria front, as we enter 2015 programmatically stronger than any previous year. According to the 2014 World Malaria Report, expansion of diagnostic testing has increased substantially, leading to a greater number of new infections being properly diagnosed and treated. For the first time, the total number of diagnostic tests exceeded the number of artemisinin-based combination therapies (ACTs) distributed, a highly encouraging trend. Deployment of ACTs also saw significant increases, with 392 million courses administered, up from only 11 million in 2005. Also noteworthy is the record-breaking delivery of nearly 190 million long-lasting insecticidal nets (LLINs) to Africa in 2014, around 45 million more than the previous record year of distribution in 2010. This distribution of mosquito nets underscores a decade-long trend of expanded coverage and an increase in access to mosquito nets from a 3% in 2004 to almost half of all people at risk of contracting malaria having access to a LLIN in 2013. 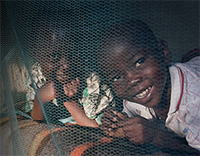 In total, these bed nets provided protection to almost 350 million people in Africa. We are now fully on track to achieve universal mosquito net coverage in 2015. The funding landscape in the coming year is also promising, with projections showing that we have largely financed the LLINs required to achieve universal coverage of mosquito nets this year. By the end of 2014, the Global Fund had received 41 malaria concept notes, including 25 from Africa, totaling approximately $2.9 billion USD. Another nine countries in Africa are presently working on their concept notes for submission in early 2015, which combined with those submitted late last year will increase the total to approximately $3.5 billion. The vast majority of these concept notes are already moving into grant making and onto malaria program implementation. To date, approximately 207 million LLINs are financed in sub-Saharan Africa. Given the above estimates, the total financing gap for all malaria control programming in Africa is projected at $1 billion USD—the lowest amount ever at the start of a new year. Of this deficit, the remaining essential commodities gap (LLINs, ACTs, and RDTs) is $512 million. LLINs comprise 56% of the essential commodities gap, with approximately 49 million unfinanced LLINs, the majority of which are for routine distribution. This funding gap is estimated to be $285 million, but given the recent reductions in mosquito net prices, this gap is likely to reduce further as savings from the price reductions are reprogrammed to buy more nets. Falling oil prices may also reduce the price of nets further and thus size of this funding gap. Nigeria, with the largest population in Africa, has the biggest LLIN gap but partners are working to support the country to close this. Initial projections indicate that addressing Nigeria’s LLIN gap will drastically reduce the overall LLIN gap for all remaining countries. Other than Nigeria, only 5 countries have a gap of more than 1 million LLINS in 2015. However, three of these countries have yet to complete their Global Fund concept notes. Thus, the funding gap may be further reduced as resources and savings are reprogrammed. The remaining $488 million gap in financing includes intermittent preventive treatment in pregnancy (IPTp), Seasonal Malaria Chemoprevention, indoor residual spraying, management costs, behavior change communication, and monitoring and evaluation. New and innovative funding streams are necessary to fill these remaining gaps and ensure we continue to build on progress achieved to date. The coming year should be a powerful end to a decade of tremendous malaria progress under the banner of the MDGs. Yet, perhaps more significantly, 2015 is ripe with opportunities for what can be achieved beyond this set of benchmarks. Years of shrewd investments in life-saving commodities for malaria have proven fruitful. Let’s seize this moment, unite partners from all sectors, and double down on efforts to sustain progress and advance our shared goal of a malaria free world.